Friends, India has emerged as world’s fastest growing large economy under the visionary leadership of Hon’ble Prime Minister Shri Narendra Modi. Today, we are seen as the engine of global growth and India has emerged as a key destination for foreign investors in recent years. Our government has a clear vision for the future of India’s energy sector and the country’s energy security. Together we are working to ensure that all people have access to clean, affordable and reliable energy, and to make India a welcoming haven for investment across the energy sector. Today India is moving to the centre stage of global oil and energy market with a rapidly rising large economy, an expanding middle-class and inspirational youth and increasing urbanization. As per estimates, India’s energy consumption is projected to grow at 4.2% per annum up to 2035, faster than all major economies in the world. Oil and gas will continue to play a predominant role in meeting our energy requirements. In this important year when we are celebrating Pandit Deendayal Upadhyay ji’s birth centenary we resolve that no energy policy is complete unless we reach out to the underprivileged members of the society. India’s oil & gas sector has made rapid strides in the past three years with several path-breaking reforms implemented in upstream, midstream and downstream sectors. While on one hand, the Government has taken reforms measures to revitalize India’s domestic oil & gas production through the policies of Open Acreage, marketing and pricing freedom, on the other hand our mission to provide access to clean cooking fuel and customer centric approach have been executed through schemes like Pradhan Mantri Ujjawala Yojana (an initiative to provide clean cooking LPG to 50 million poor households) and the deployment of the PAHAL Direct Benefit Transfer of LPG subsidy which has been recorded in Guinness book of World records being largest Direct Benefit Transfer scheme. In order to move towards a gas-based economy in the coming years, our thrust is to develop more LNG re-gasification capacities and expansion of the country’s cross-country gas pipeline network by another 15,000 km. Pradhan Mantri Urja Ganga Project is one such ambitious project that is underway. We have also embarked on environment friendly alternate fuel program. We have launched ethanol blending program and Oil PSUs are setting up 2nd Generation ethanol plants. It is a matter of great pride for me to see the entire Oil & Gas Industry coming together to work towards fulfilling our Prime Minister’s dream of a Poverty free, safer, cleaner & healthier India: A ‘New India’. As our Prime Minister has rightly said, “In 1942, the clarion call was ‘Karenge Ya Marenge’ – today it is ‘Karenge Aur Kar Ke Rahenge’”. We must all continue to Strive. The upcoming five-year period gives us a unique opportunity of ‘Sankalp Se Siddhi’, towards a New India Movement (2017-2022). On this Independence Day, let us all inspire a serving attitude in our mind, work for the country, and fulfil our responsibilities. With this thought, my heartily greetings and well wishes to you all on the occasion. I would like to know your opinion & views about how can we improve on our existing schemes & develop better policies. Last month GAIL signed a MoU with a US based company started by an Indian origin scientist promoting power generation from Fuel Cells using natural gas. This smart way of power generation without the need of transmission network and power grid has the potential to provide reliable and affordable power in rural and remote places besides the fact that it can immediately replace expensive and polluting diesel genets based power in metro suburbs. The effort of our Government led by Hon’ble PM is to move towards a gas based economy. During his tenure as Chief Minister of Gujarat usage of gas in energy basket of Gujarat increased to about 25%. Our efforts to promote gas based economy presupposes that gas will be promoted as cooking fuel in form of PNG transport fuel as CNG and LNG for automobiles, trains & ships; feedstock to run power and fertiliser plants and as fuel industrial growth of India. The general perception about natural gas is that it’s a rich person’s commodity; a clean but unaffordable source of energy. This had partially been true but its changing fast with technological advancements and development of global supply networks. Gas is much cheaper than liquid fuel. It is estimated that if India replaces 1% of its imported crude with imported gas, it would cut its import bill by Rs. 3,000 crore per annum. If we further replace it with domestically produced gas, the savings would be in the order of Rs. 7,000 crore per annum. Currently, even imported natural gas (LNG) as transport fuel is cheaper than diesel and petrol and PNG is cheaper than non-subsidised LPG as cooking fuel. Similarly gas based power from Fuel Cells is likely to be cheaper in near future than its competitors. These increased savings can be redirected into development and public welfare projects. At a consumer level, if each of us replace 1% of our diesel or petrol consumption with gas, it would account to a saving of Rs. 30-40 on every Rs. 100 spent on fuel. Natural Gas is the cleanest burning fossil fuel. It has an almost perfect combustion process and emits very few pollutants. This non-toxic fuel can significantly contribute in cutting down carbon emissions. Using it in fuel cells through a non-combustion process reduces the pollution level even further. Natural Gas is a versatile fuel. It is being used for multiple purposes – from domestic cooking to power generation. It can be used for transportation, fertilizers and petrochemicals. It is highly efficient, convenient and reliable source of energy – it can be transported via pipelines, including to the end consumer and the transmission losses in transportation are minimum in comparison to all other fuels. The government is committed to making natural gas a big player in the energy mix. 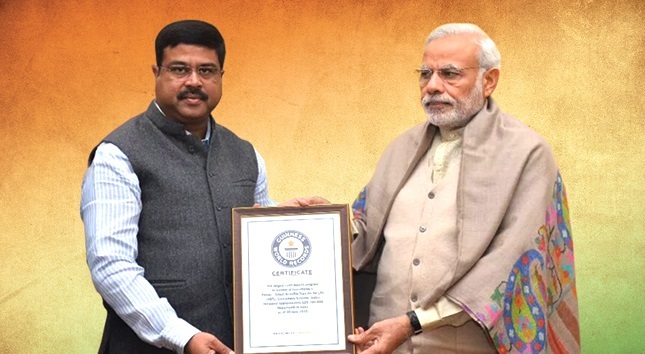 It has taken several steps to enhance the availability of gas in the country – like accelerating E&P activities, expanding the existing gas pipeline network, developing import infrastructure for LNG, boosting domestic production, promoting usage of PNG, CNG and LNG etc. #Gas4India – This mission is to transform India by adopting this affordable, cleaner and more efficient fuel as the most preferred source of energy. This is possible when each citizen participates and makes the switch to natural – for a brighter and cleaner future. This portal is a humble effort by the industry to help citizens make this switch – by collecting all viewpoints, addressing all concerns, and resolving all issues and challenges. I look forward to hearing from you all as we build a collective consciousness on #Gas4India. For the second time in two years, the opposition pushed through its amendment motion in Rajya Sabha. The amendment pressed on the motion of thanks to President’s address didn’t challenge anything that the President included in his address, rather curiously, it regretted that the address did not include something which, in any case, could not have been included. The issue was Haryana and Rajasthan governments’ move to prescribe minimum educational qualification to contest panchayat elections. It was also prescribed that not having a functional toilet at home would make one disqualified to contest the elections. The opposition argued, given the literacy situation in the country, such steps are regressive as they would make a significant section of society, especially the poor and weaker sections, ineligible to contest in the election contrary to their fundamental rights to do so. And the Centre cannot keep mum in such an important issue. The fact is that the Centre could have done little in the matter. The Haryana amendment law (regarding qualification to panchayat election) was challenged in the Supreme Court and the court made it clear that right to contest election is not a fundamental right. Further, the state legislature is the competent authority to prescribe qualification to panchayat election. In light of the observation of the Supreme Court, the ruling party tried to reason with the opposition that the motion was factually and legally incorrect and should not be pressed. But, the opposition moved ahead, seeing it as an opportunity to embarrass the government. It chose to score brownie points, instead of being seen as a responsible opposition. It is unfortunate as they fully understand that given the legal and constitutional provisions the only way the Centre could have interfered is by taking away such powers from the state legislatures through an amendment of the constitution in complete disregard to our federal structure. What message did the opposition want to convey through the amendment motion? It’s nothing but an assertion of numerical strength. The real unintended impact is that ruling parties would gradually ignore such amendment motions. A fine instrument in the hands of the opposition to be watchdog and conscience keeper loses its shin. Rather, the more pertinent question is how come so many people for so long remained deprived of education and toilet facility? It’s because there are parties which do politics in the name of poor but are never interested in eliminating poverty. They will be out of political business if poverty is eliminated. The present situation is a result of such politics or rather political business. Take for example, the case of GST. Even after consensus on most/all controversial issues, the congress is today inventing new issues to stall the passage of the GST bill. It is common knowledge that implementation of GST would increase GDP by at least one percentage point. The opposition to GST by Congress has simply remained hostage to personal interests of the Congress president and vice president. The day both were summoned by court in National Herald case, Congress leaders took turn to convey the message that now GST would go for a skywalk. Where is national interest? Wouldn’t higher GDP help more effective pro-poor welfare schemes? But no, for such parties the poor is just a means to win elections. It is because of the legislations in Haryana and Rajasthan that the issues of illiteracy and open defecation have gained further momentum in public discussion. More than four lakh toilets were built during the recent election. The new laws also encouraging educated people, who till now were reluctant to enter politics, to come forward to take part in politics. Isn’t it enrichment of democracy? The main opposition party should be more interested in improving living conditions of the poor in the country who have allowed them such a long run in the national politics, instead of looking to score brownie points over the government. The people of this country would not forgive Congress for obstructing the efforts of Hon’ble PM Shri Narendra Modi in whom they saw a ray of hope and voted overwhelmingly to take the nation in path of rapid progress. Today, it is not an embarrassment that an opposition sponsored amendment motion was adopted in Rajya Sabha, but the real embarrassment is the spectra of Congress party, the grand old party of India that spearheaded the freedom struggle, putting individual interests of Party President and Vice President above national interest. Swami Vivekananda once rightly said, “The powers of the mind are like the rays of the sun, when they are concentrated they illumine”. This power fulfills hopes, aspirations, ambitions, of one and many. With this thought process, the Government under leadership of Honorable Prime Minister Shri Narendra Modi has a constant desire to bring a positive change in governance and help common people achieve their goals and ambitions. In the context of growth of national economy,development of the country and fulfilling aspirations of common man availability of reliable and affordable Energy plays a crucial role. Consumers from all sections of the society need energy to keep their days going. I might be heading the Petroleum Ministry, but even that doesn’t make me any less of a consumer, or diminishes my need for Energy. Hence it is the consumer in me who also drives my mind and my thought process. The year gone by, has been a year of innovative drives wherein several path-breaking policies were introduced that had significant, positive impact on the lives of consumers. Following on that path, we are introducing various new measures to make – 2016 as the ‘Year of Consumers’. The WHO estimates that more than 5 million women die every year in India on account of using polluting cooking fuel. This is unacceptable for the present Government. We have set ourselves a target of providing LPG connection to additional 10 crore households in next 3 years. Already several hundred villages have been declared smoke free with LPG connection provided to each household in the village in last one year. I seek cooperation from all,especially from the Gram Panchayats, to take initiative on this line to get their villages moving towards this direction. Last year, millions of people surrendered their LPG subsidy and are still continuing to do so , under the #GiveItUp Campaign. This has greatly supported the Government’s vision of LPG expansion in rural areas. As promised by Hon’ble Prime Minister the money saved was utilized to provide LPG connection to more than 50 lakh BPL households so far. 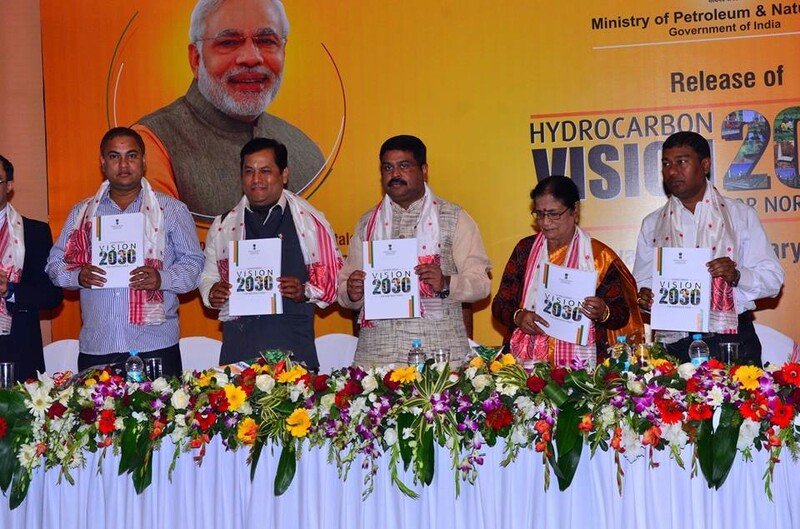 This is not merely about providing LPG connections; rather, with this, more than 50 lakh women and their families have been empowered to lead healthier lives. With increasing number of consumers, comes a greater demand for energy. To address this, we have set a target of opening 10,000 new LPG dealerships in 2016 all across India in addition to the existing 16,000. Similarly, we are planning to introduce schemes like payment by easy installments (EMI’s) for those availing new LPG and PNG connections. User friendly light weight plastic and transparent cylinders of various sizes will also be introduced in 2016. Cylinders of small sizes (5kg and 2 kg) will be made widely available which will bring greater convenience to smaller families,students etc. 2016 will also witness special emphasis on making petroleum products available in a smooth manner in hilly,remote areas and various islands. I am aware of the difficulty being faced by consumers in these areas to get LPG,petrol and diesel. I am aware that consumers in many islands in Andaman and Nicobar Islands pay as high as 33% higher amount to get petrol and diesel. We live in a technology enriched world today, which has opened up new ways of connecting with people. Taking this into account, greater emphasis is now being laid on linking governance with online platforms and social media platforms like Facebook & Twitter to address the concerns of the consumers. I try to use these media outlets as much as possible to share my thoughts and views as well; this blog is a similar endeavor. We have made attempts to provide LPG through consumer integrated online solution for all services including supply of cooking gas and tracking their delivery by visiting – www.MyLPG.in. We have already introduced online booking of LPG cylinder and online registration for new connection and also online payment for refill of cylinder. 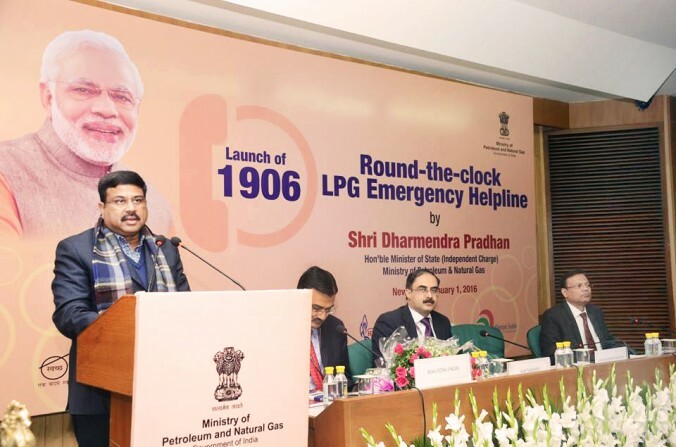 During the first month of 2016 itself, we have launched online payment facility for refill of cylinder and a round the clock LPG helpline number 1906 has been launched for immediate assistance to consumers in case of LPG leakage. Transfer of LPG connection from one place to another and also from one company to another will be made a hassle free affair. There will be more focus on addressing the grievances in a time-bound and transparent manner this year. We also plan to install touchscreens in prominent places like railway stations, airports, malls, to provide seamless services to the LPG consumers. The idea behind these initiatives is to provide world class facility in marketing of petroleum products at affordable price. The idea is also to target subsidies in LPG and Kerosene to reach those who actually deserve it. And at last the idea is to gear the systems to rise to the occasion and meet expectations of consumers by connecting with them and make 2016 and years to come, fruitful and energy rich for all. I also seek your ideas, suggestions and proposals to bring in new mechanisms and policies to make successful our resolve to make 2016 a year for Consumers. This blog, the online platforms of Ministry and the online discussion forums at mygov.in and mylpg.in are open for your valuable inputs. I take this opportunity to wish you, your family and your dear ones a very Happy and Prosperous 2016! The New Year springs up riveting moments. Undoubtedly, we are at an advantage, as global crude oil prices have plummeted to nearly 11-year low and we could reap the benefits as the fourth largest consumer in the world. I have come across various experts’ reports that suggest that if oil prices continue to remain at these levels, India could save close to $60 billion, or 3%, of the GDP. This environment also helps our Government to bring in pro-poor reforms, consumer friendly initiatives and modernise the oil and gas sector. While the footfall received at refuelling stations (Retail Outlets) and LPG distributors is the highest in the country compared to any other sector in the country, still close to 5 lakh women every year succumb to ailments for using hazardous cooking fuel. This is an alarming situation and it’s the endeavour of this government under leadership of Prime Minister Shri Narendra Modi to provide our mothers and sisters a hassle-free and hygienic cooking environment. Our focus in 2016 would be to offer “3As — Availability, Accessibility and Affordability – of clean and green fuel.” Our guiding principles for policy formulation would be – a consumer-focused approach, prior consultation in policy making and transparency in decision making. The government under the leadership of Prime Minister Shri Narendra Modi would take every step to offer clean domestic cooking gas to every household in the country and completely eliminate the polluting chulhas. I would like to thank the 5.8 million LPG consumers who have given up their subsidies. This small effort by an individual would serve a bigger cause towards nation building. 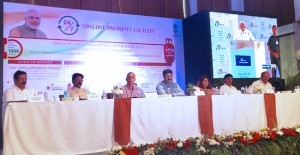 While rolling out the services, Government would ensure that the subsidies reach the targeted and those in need of it. It is in this spirit it has been decided that individuals (along with spouse) with more than Rs 10 lakh taxable income will not be provided subsidy in LPG from 1 January 2016. The PAHAL scheme, which has being recognised by Guinness Book of World Records as the largest cash transfer programme,brings in a transparent mechanism and eliminate from the system fake and those individuals indulged in corrupt practices. The Government is working towards further reducing the fuel subsidies and a targeted mechanism for kerosene subsidy would also be rolled out in the due course. After the launch of PAHAL, the oil marketing companies have witnessed around 6.4% growth in LPG demand during the first six months of 2015. These numbers are going to rise, as clean cooking fuel heads for every kitchen in the country. During the same period, the demand for auto-LPG has risen by about 7.5%, which earlier was witnessing a negative growth. This brings to limelight the end of black marketing of subsidised domestic cooking gas. We would soon auction marginal oil and gas fields based on investor-friendly fiscal terms, which for the first time in the country offers marketing and pricing freedom to explorers along with fresh guidelines that ensure no government interference. This would be one of the steps towards achieving the milestone given by Prime Minister to reduce import dependency by 10% by 2022. On the path to make ourselves energy-rich, it is important to protect our environment. My Government is working towards creating a natural gas based economy in the country, which is not just cost effective but also in sync with our commitment towards cleaner environment as made in COP 21. With the expansion of pipeline networks and penetration of city-gas distribution lines to larger areas, the demand for gas volumes would get major boost. This would effectively lead India towards a mature gas market and also push manufacturing opportunities for industries under Make in India campaign. Promotion of Bio-fuel is another area, which the Government would like to focus in a major way in 2016. The idea behind starting this blog space is to communicate informally and regularly with you. With the help of technology, I would like everyone to be aware of what policy reforms we are taking and how it would help the country to progress. I look forward to your valuable feedbacks and suggestions. Once again, wishing everyone a joyous New Year!